with Spiritual Director Father Raul Ruiz S.D.S. ARRIVE ROME. MASS, DINNER AND OVERNIGHT. 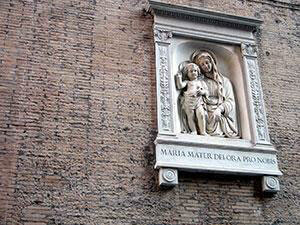 (Possible Angelus with Pope or Papal Audience). Rome. In the morning after breakfast we start with Christian Rome tour which includes Saints Mary Major & John Lateran, St. Paul Outside the Wall, Holy Stairs, and Holy Cross in Jerusalem. Dinner and overnight in Rome. Rome. After breakfast we will visit the Vatican Museum, Library, and Sistine Chapel. After lunch we will tour St. Peter’s Basilica with time to shop the Vatican Store. In the evening we transfer to Tanagra Restaurant at 19:00 p.m. for dinner. Overnight in hotel. Rome. After breakfast we will depart to attend the Papal Audience. We will leave for Montecassino to visit the Abbey. Depart for Nola, dinner, and overnight. After breakfast, we will depart to Pietrelcina to meet our guide and visit Padre Pio's hometown. Transfer to San Giovanni Rotundo, dinner, and overnight. After lunch we will depart to Mugnano Del Cardinale to meet our guide and visit the Shrine of St. Philomena. After breakfast we arrive in Bari to depart to Monte Sant’Angelo (Cave of St. Michael) erected over a grotto where the Archangel Michael is said to have appeared in the year 490 for a visit. 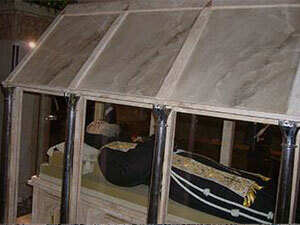 We will then continue to San Giovanni Rotondo to visit the Church and view the incorrupt body of PADRE PIO. Visit places associated with Padre Pio, his tomb and cell; the old church where he received the stigmata; his confessional; and the new church of Santa Maria Delle Grazia, dinner, and overnight. After breakfast depart to Lanciano to visit the Sanctuary of the Little Church of St. Legontian, and the 8th century Eucharistic Miracle, one of the most moving sites for a pilgrim in the world. This is the divine response to a Basilian monk's doubt about Jesus' Real Presence in the Eucharist. BOAT TO SPLIT (overnight on board). Early morning arrival to Split. Guided city tour and proceed to Medjugorje. Meeting our guide for a tour. Dinner and overnight. Day 10 and 11 After breakfast we will experience the beauty and peace of this simple village. 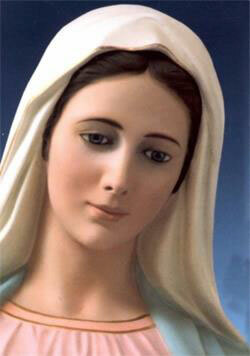 During your stay you will have the opportunity to be guided by our Lady Queen of Peace. You will learn the layout of the village, visit the Church, climb the mountain, pray the Rosary, and take advantage of all events during our stay. Breakfast, dinner, and overnight. After breakfast we will depart to Split via of the falls and Little Lourdes. We will then check in for our departure on the boat. Dinner on the boat with accommodations in our cabin. Arrival at Loreto and meet our guide to visit the Church and the Holy House of the Blessed Virgin Mary. Dinner and overnight. Early morning departure to VENICE – half day city tour including a boat ride and visit to the Church of St. Mark. Transfer to Padova for dinner and overnight. Visit Padova, the church of ST. ANTHONY AND THE CHURCH WHERE THE RELICS OF ST. LUKE ARE then depart to Montichiari, the SHRINE OF OUR PATRONESS, ROSA MYSTICA. We will visit the place where Pierina saw the Apparitions of "Rosa Mystica" (THE Mystical Rose) and Fontanelle which includes the Shrine and the “SPRING OF GRACE” Our patroness for Priests asks us for prayer, sacrifice, and penance. We will depart for Siena, dinner and overnight. We will have city tour of Siena and visit the Church of St. Catherine of Siena then depart for Assisi for dinner and overnight. For a visit including OUR LADY OF THE ANGELS. Dinner and overnight. We will have half day city tour in ASSISI and include a visit and Mass at OUR LADY OF THE ANGELS. We will then transfer to FCO AIRPORT FOR OUR FLIGHT HOME WITH MEMORIES TO LAST A LIFETIME. MASS WILL BE CELEBRATED EVERY DAY. All services as per itinerary. Transportation by coach for whole period. Porterage at some hotels that do not have service. Any other services which are not mentioned. MISSION STATEMENT: JMJ Ministries is committed to providing pilgrimages (not vacations) to benefit our Priests and lay people. This is only possible through the intercession of Our Blessed Mother, under the title of Rosa Mystica, patroness of Priests and Religious who guides us all the way. A Booking may be canceled but must be made in writing by either party. Refunds are returned upon the booking of another person to replace the refundable person on this pilgrimage PRIOR TO LAST 30 DAYS. JMJ Pilgrimages acts only in the capacity of agents for the Airline and the Land Operator in all matters pertaining to Hotel Accommodations, sightseeing tours and transportation, whether by air, railroad, motor coach, motor car, steamship, boat or any other means and, as such, holds no responsibility for any damage(s) from any cause(s) whatsoever. JMJ Pilgrimages will not be responsible for any damage, expense or inconvenience caused by the air, rail, ship, boat or bus arrivals or departures or by any change in schedule or their conditions; baggage or any article belonging to the passenger. The right is also reserved to decline to accept or retain any person traveling under our auspices. The concerned are not to be held responsible for any act, omission or event during the time the passengers are not on board their plane or conveyance, or in the car, limousine or bus of ground transportation operators, or in the premises of hotels, pensions or other places of accommodation. The passenger contract used by the carriers concerned, when issued, shall constitute the sole contract between the carriers and the purchasers of this tour and/or the passenger. JMJ Pilgrimages is not responsible for any and all funds paid to the airline and/or land operator on behalf of the passenger which are the subject of refund, dispute, insolvency or any other reason whatsoever. The undersigned will indemnify and hold harmless JMJ Ministries from any and all liability whatsoever, including attorney’s fees and costs, from any claims by anyone.